I was wondering if anybody has seen any of these in service? Or even old photos somewhere? Info? those would make good floor lamps!!! If you had a really high ceiling!!! 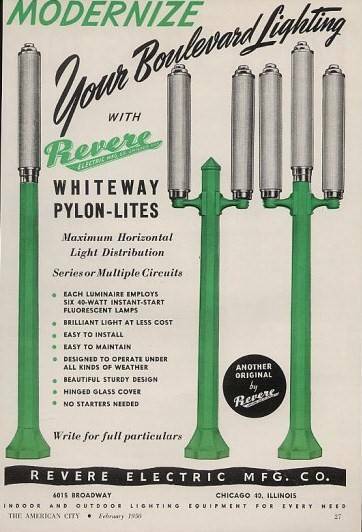 I know that during the 1950s, there were fluorescent luminaires lighting Seventh Avenue in NYC according to a website I was looking at once, but I still have yet to find pictures of them. Maybe you could do a search on that and you might find out some more info. about this type of luminaire. I'll try to search too and if I find anything I'll let you know! @Dimbulb well yeah,but the design looks so cool,if your one of the crafty types,its possible to make your own version for home use. True! Maybe DaveMan could create something like them!!! I good at fixing old stuff but not designing things. I already got ideas of designing it actually!!!!!!! So far my thinking is a 4 lamp F15T8 preheat! good jace,cant wait to see it! By the way I see it says it's from 1950, and it mentioned instant start and no starters needed.....so would they be single pin or a 2 pin rapid start? It's just how it says "instant start"
Never heard of a single pin 40w lamp.